In one of the central papers of "new new" trade theory , Melitz proposes a framework in which the effect of trade on firm productivity at the aggregate industry level can be analyzed. Productivity at the firm level is drawn from a distribution that determines the variable cost of production. (Following , the Pareto distribution is used in this Demonstration.) 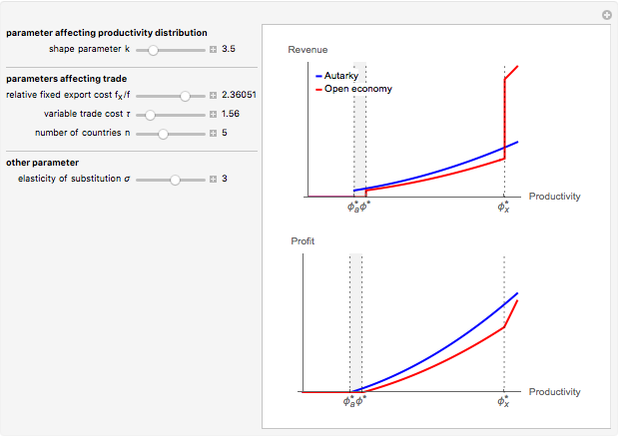 The model endogenously determines cut-off productivity levels (the *): in autarky, only firms with productivity , where is the cut-off productivity level in an autarky, serve the domestic market. In the open economy, firms with productivity , where * is the open-economy cut-off productivity level, sell goods in the domestic market, while firms with export as well. Firms with productivity are forced to exit the market when moving from a closed to an open economy. To summarize, as low-productivity firms exit and the most productive firms gain market share, trade increases firm productivity at the aggregate level. 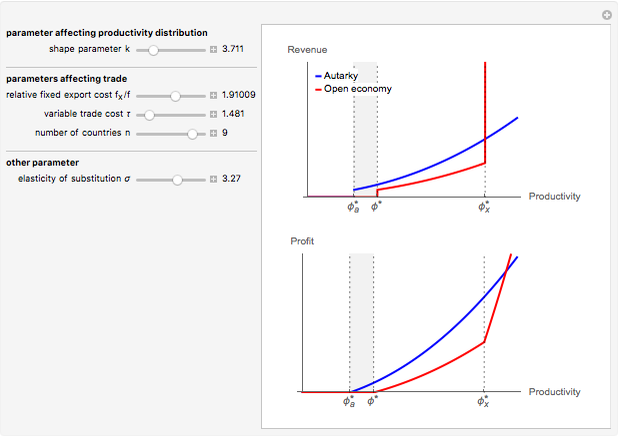 The graphs show how firm revenue and profits differ between an autarky and an open economy, depending on the various exogenous model parameters. 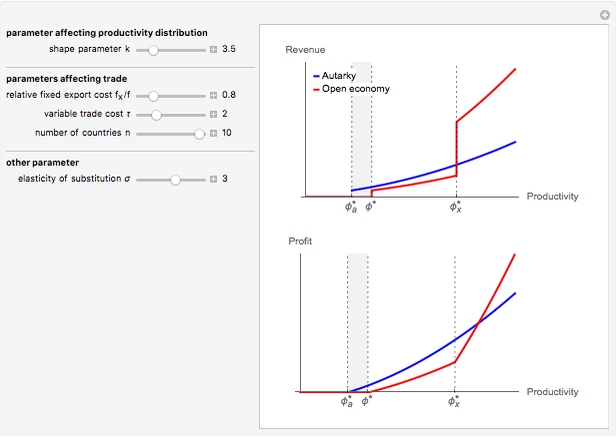 As mentioned in the caption, when moving from a closed to an open economy, firms with low productivity cease production (these productivity levels correspond to the shaded areas). Additionally, as foreign firms enter the domestic market, all firms incur a revenue loss on domestic sales relative to the autarky scenario. For firms which are not sufficiently productive to export (with productivity ), this translates into an overall loss in revenue, profit, and market share. Exporters, on the other hand, make up for losses in the domestic market with export sales. However, as they have to bear additional fixed export costs, only the most productive firms are able to earn higher profits through trade. This leads to an overall relocation of market share towards the most productive firms. The magnitude of this effect, however, very much depends on the exogenous model parameters. For example, by increasing the fixed export costs relative to overall fixed costs ) to prohibitively high levels, the results are almost identical to autarky. Higher variable trade costs increase the cut-off productivity level required for exporting ( ), so fewer firms export and we again get a situation similar to autarky. A higher number of trading partners causes domestic firms to lose additional market share, so even lower-productivity firms have to exit. E. Helpman, M. J. Melitz, and S. R. Yeaple, "Export versus FDI with Heterogeneous Firms," American Economic Review, 94(1), 2004 pp. 300–316. M. J. Melitz, "The Impact of Trade on Intra-Industry Reallocations and Aggregate Industry Productivity," Econometrica, 71(6), 2003 pp. 1695–1725. Richard Foltyn "Impact of Trade on Firm Productivity, Revenue, and Profit"